Bacon and Chocolate. 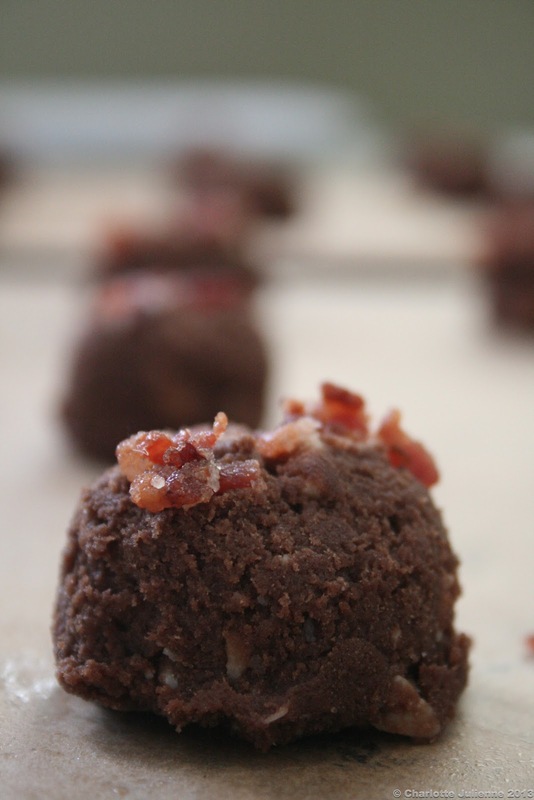 Chocolate and Bacon. We wanted to use both and went back and forth between what to make. Brownies with Salted Carmel and Bacon…it was our first choice, but seemed to be overdone in the land of the food blog so we kept trying. Chocolate cake with toffee and bacon…too similar. Chocolate chip cookies with bacon…still not working for us. When we came across Ina Garten’s recipe for chocolate white chocolate chunk cookies we thought now here is something that would be great with bacon…and we are glad to report that we were right. Begin by pre-heating your oven to 350. In your mixing bowl add both sugars and butter. Cream until light and fluffy. Add the vanilla and the eggs (one at a time) and mix until combined. Add the cocoa and mix again. The mixture will take on the color of the cocoa. Meanwhile, in a separate bowl, sift together the flour, baking soda and salt. Add to the chocolate mixture until just combined. Scoop the cookies onto parchment lined sheets (we sprayed ours) and set aside. 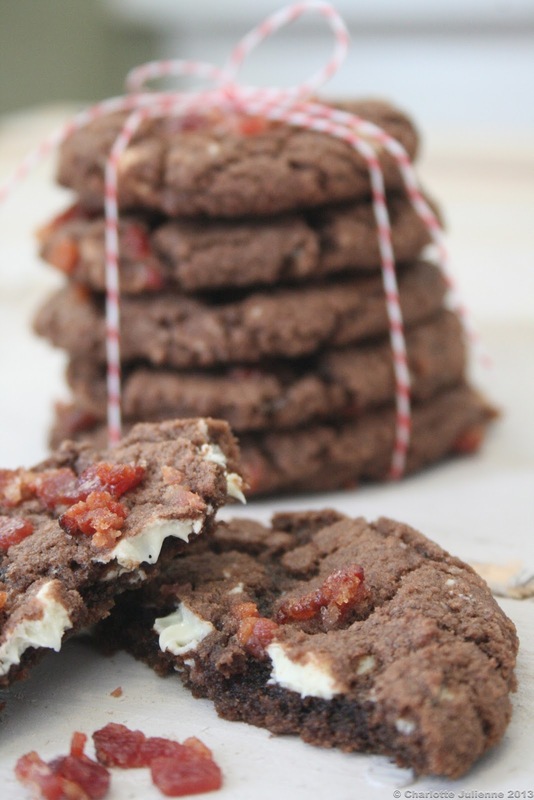 As we mentioned earlier, we decided we wanted to use bacon in this cookie recipe. In a hot pan we added slab bacon cut into a dice and cooked until crispy. We candied this by adding a spoon of sugar to the bacon as it was nearly done cooking. When it was done we let it cool and then placed it in a bowl. Each cookie was then dipped in the candied bacon and placed back on the cookie sheet. The cookies baked at 350 for about 15 minutes. As stated in Ina Garten’s recipe, the cookies will seem underdone. This is true. We like to bang our cookie sheet on the oven rack during the last minute of cooking. This flattens them out and we love them that way. 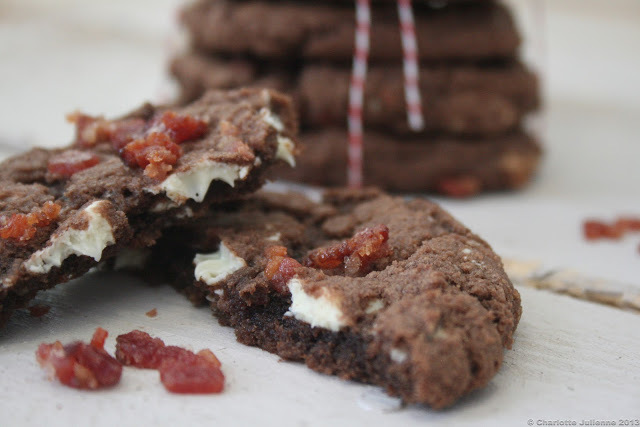 When the cookies come out they appear crackled and the bacon is allowed to nestle into the crevices. Even better, when you break them open the white chocolate chunks are melty. The cookie is crispy outside, gooey inside and sweet as could be. As you take each bite the flavor and saltiness of the bacon hits you at the end. A great combination of bacon and chocolate. Perfect for our Sunday afternoon baking project.